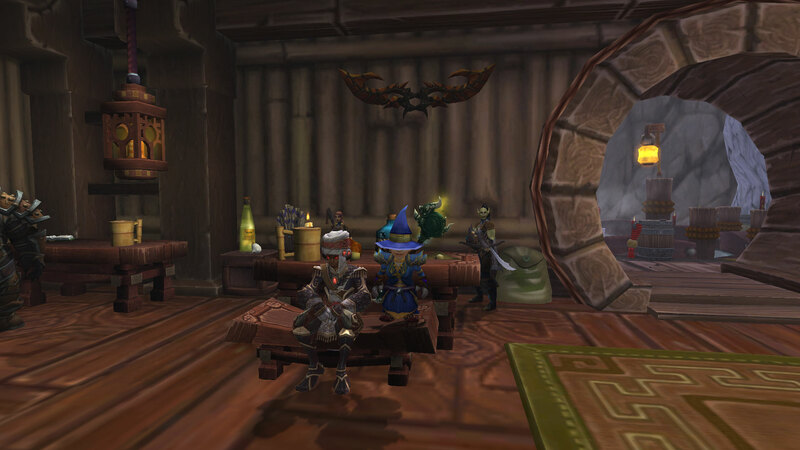 From both of us here at Growing up in Azeroth, we wish you a happy holidays! Yotaan and I are going on vacation, so we will be afk for a week or so. Bye! I’m not one for tooting my own horn, but I feel like this is a good story to share. A little while ago, I was in a LFR for Heart of Fear, trying to get my last sigil of wisdom (yes, I know, I’m lame and everyone and their dog has done it by now). 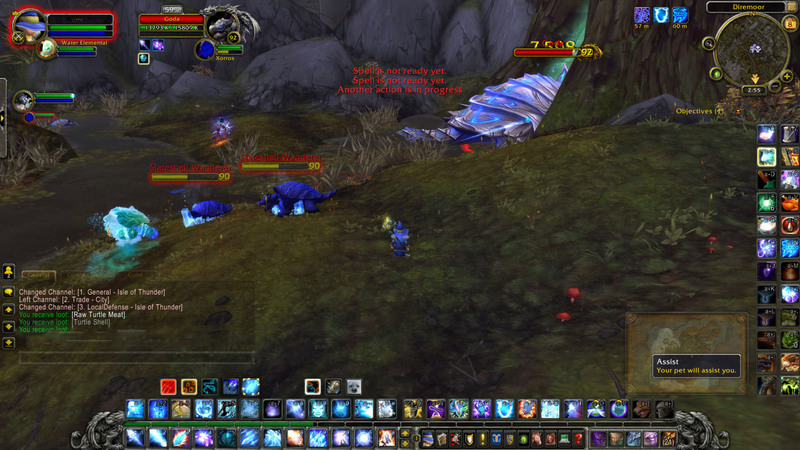 I zoned in to find everyone in the raid dead, and a pack of trash mobs on me. So, of course, I died. The chat was spewing hatred about undergeared tanks and some such junk. I didn’t really pay attention as I just wanted to get my sigil and go. So, the fighting in chat continued and we all rezzed and cleared the rest of the trash. 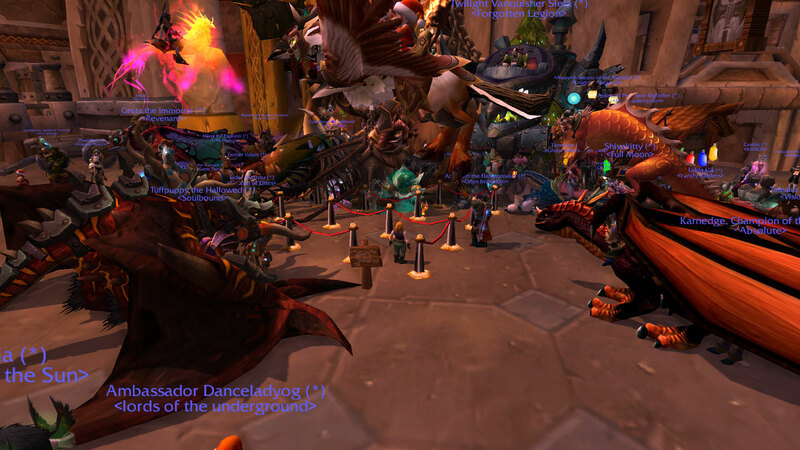 We now stood, waiting to pull Imperial Vizier Zor’lok. Amid a flurry of insults, the tank pulled, and the fight began. Things were going pretty smoothly until the boss casted Force and Verve (for those who don’t know, the boss puts out high raid wide damage, which is dampened by shields areas that players must stand in). About 2/3 of the raid did not get inside the shields in time, and they died. Me, about five other DSP, some healers and the tanks were all that was left. This is pretty unusual, as the raid is old content. 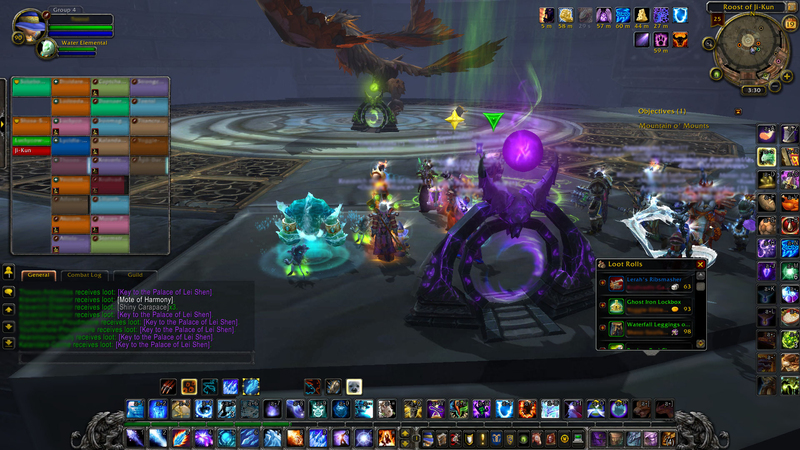 The 1/3 left of the raid continued on, and almost beat the boss, until the enrage timer hit. At this point, the chat literally exploded. I swear I actually heard a small bang as insults and blame began to fly everywhere. The damage and healing recounts were posted several times (I was second on damage!) and eventually, some people dropped group. At this point, I finally committed to this group (funny, because no one else was at the time). I asked in chat if any one didn’t know the fight. One person admitted to not knowing it (and I suspected there were more) so I gave a quick rundown of the bosses abilities and what to watch out for. The tantrum in chat died down (as most of the tantrumers were gone) and we pulled again. This time I called out mechanics (like when to go in the bubbles and when to target the MC’d people). Amazingly, we downed the boss first try. No one even died. After a bit of celebration, we moved on to the next boss. Again, I gave a run down for the fight, mainly to stack for Unseen Strike. After clearing the room, we pulled the boss. Every time I could, I typed in “stack” to remind people to stack. And oh, the difference it made! I think that was the only group I’ve been in where every person stacked when we needed to. At one point, I miss typed “sack” instead, which created a whole slew of joke in chat. People were laughing and having a good time. We cleared the rest of the raid without problem. I guess the moral of this story is that by taking the time to help people, it can have amazing benefits. I joined a raid where everyone was fighting and angry, and just by calling out boss mechanics, I was able to change the raid into a joking and fun run. Instead of dismissing those who don’t know the mechanics, take the time to explain it to them. Hurling blame will get you nowhere, but being positive can make the most dismal situations better. It will work out better, trust me. I will be the first to admit it. I do not like spirit. Yes, I am well aware that it is one of the only stats that work as flexibly as intended, but I still don’t like it. Spirit, in my mind, is a crutch stat. Healers can stack spirit to the point where they don’t need to manage their mana. With the excessive amount of spirit that reforging can give you, healers many times no longer have the valuable skill of mana conservation. They don’t need to. And that is what I disagree with. In my perfect WoW world, spirit would not have such a big effect on mana regen. Healers would start with more spirit regeneration when they hit max before gearing up. This would help with two things. The first is that it would make healing at lower gear levels much easier to do, without simplifying the game. I remember, when I first hit max on my holy paladin, I was constantly running out of mana. Even using my Divine Plea, I went oom every pull. No mana on top of my already weak heals made healing very stressful and very hard. By making the mana regen better, under-geared healers will be able to heal more often (even though our heals will still be weaker). The second reason is the mana managing skills of a healer will matter more for longer. Instead of being able to stack spirit into oblivion, healers will actually have to watch their mana. I am not saying, that I want to dumb down healing. In fact, my opinion is that spirit does that. With a less influential sprirt, healing may become more dificult. Having to manage mana is not something every healer can do, but I think every healer should know how to. Another complaint I’ve heard with my argument is that downgrading spirit is forcing healers to heal one way. While that is a valid point, I don’t necessarily think that is true. Yes, downgrading spirit would essentially remove one way of gearing a healer, there are many other ways. Healers can gear for faster heals, or bigger heals, or mastery heals. Gearing for spirit is the ‘safe’ way, where you can heal with abandon and not have to worry much about mana. As I understand it, Warlords of Draenor is going to drastically change spirit and healing in general. With WoD, it was announced that reforging was going to be removed. The stats on your gear cannot be changed in any way. This is a very good solution to the spirit problem. Healers will still be able to find gear with spirit and stack that, but it will be much harder to do so. Healing will go back to being more mana managing instead of spirit stacking. However, healers will still be able to stack if they choose. The choice will go from mandatory (as it is now) to optional. To sum up, I don’t like spirit. I think today, healers rely too much on it, which makes lower gear healing very hard and higher gear healing almost too easy. I think better gear should bring bigger or faster heals, not the ability to ignore your mana. This post was inspired by an article on WoW Insider. Fussypants: The quest line for the legendary cloak is a pain. Sure, it is an eventually satisfying pain, but a pain all the same. But it also represents one of the most successful aspects of video games. I recently started to seriously work for my legendary cloak. I had just collected about 7 or 8 sigils, and I think I was honored with the Black Prince. So basically, square one. After a week finishing up with my sigils, I killed the Sha, and got my Chimera of Fear. I turned it in, and got the reward for the first step, the legendary gem. I have long since upgraded my sha-touched weapon, but I socketed it in the staff all the same (I had kept it in my bank). When this was done, I moved to the next step. A buddy and I grinded out Krasarang mobs, and I arduously capped my valor for three weeks. After this I won the Temple BG quickly, and struggled with Silvershard Mines for almost a week. I lucked into a group doing A Change in Command, and I’m now collecting my secrets and grinding more rep. The quest is long, even longer when you are playing catch-up. But somehow, it has also kept my full attention for more than a month. And this is why the legendary quest line is so successful. It can keep you engaged for the long haul, even for the least time dedicated players (me). By offering small rewards along the way that lead to an immensely powerful item, this quest has been my goal for almost religiously for two months now. This philosophy of breadcrumb rewards leading to an awesome final prize is also what makes games like WoW so addicting too. When you think about it, the cloak quest line is a culmination of all the addicting powers of WoW. I find this fascinating, but also a bit disturbing. Human nature is so obsessed with rewards, and this is the perfect trap. Yotaan: I have to pipe in and agree with Fussypants, the cloak legendary questline is a pain. My toon started the grind several months ago and stalled out collecting secrets from the last 2 raids. I believe I have 3 out of 20 secrets. They just would not drop! And, this is absolutely the way it should be. If it’s legendary, it should take a lot of time and effort. Nothing worthwhile is easy. Unfortunately this process burned me out. No progress on that front has been made in many weeks. However, I am getting more and more tempted to start up again. Can’t have my daughter trump me! A good friend of mine recently got World of Warcraft for the first time. I think this had been her first MMORPG experience, so she was completely new to the game. As I played along side her for her first time, I realized some amazing things. My friend decided on night elves, so we both rolled night elves. I rolled a rogue, and she rolled a, you guessed it, hunter. When you think about it, all new players begin with a hunter, or try a hunter at some time. 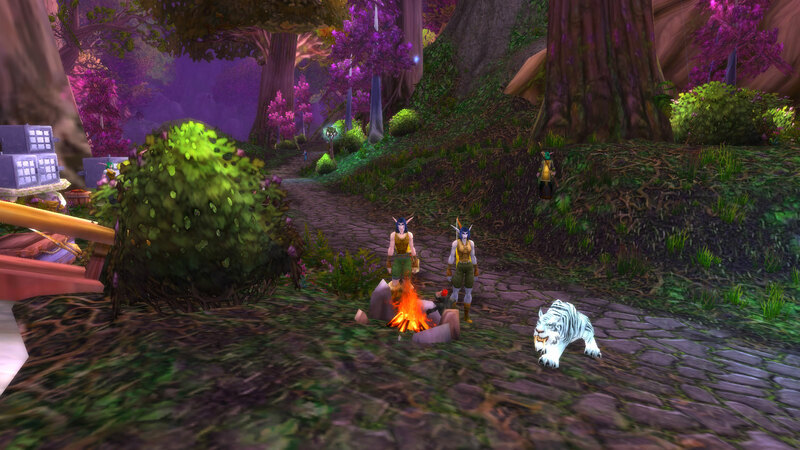 Case in point, I started the world as a draenei hunter. My dad began playing as a dwarf hunter. My brother started as a night elf hunter. My best friend started as a blood elf hunter. And now this friend of mine was starting as a night elf hunter. Its kind of bizarre. I fully expected my friend to need help navigating the world. But what I did not expect, was the amount of help she needed. There were many times where I would ask her to come to me or loot this corpse, and she wouldn’t know how. 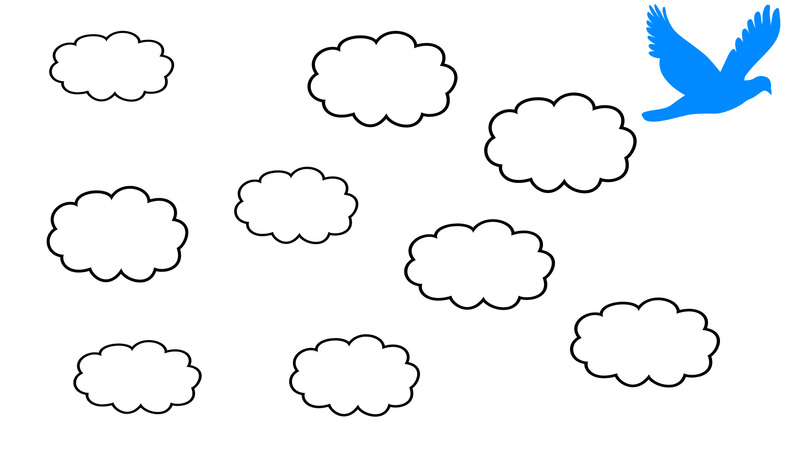 I had forgotten how even (seemingly) simple things are hard for beginners to get. The New Player Realms are CRAZY! When my friend got the game, she was instantly shunted to one of the new player realms. To make things easier, I rolled a character there, and we were off. And it was insane! There were over 60 other characters in the starting area alone! Every mob had to be camped at some point, and we kept losing each other in the sea of purple night elves. I won’t deny it, teaching someone how to play WoW can be trying at best, and down right aggravating at worst. But even through the repeated trips to the same area for the quests you thought your friend had gotten, to the general wandering of all new players, I learned something. Being able to share something that you are really passionate about with someone who will listen is awesome. I loved questing with my friend. True, it was slower than I usually go, but it was worth it. I noticed a lot of little things in the game that I normally would miss. I also learned a lot about me (as corny as it seems). I had to work on patience, but it was more than worth it. All in all, I really am enjoying questing through the world with my noobish friend. We are slowly, but surely, exploring the world. I will probably post more about our mishaps and adventures as we go, so stay tuned! 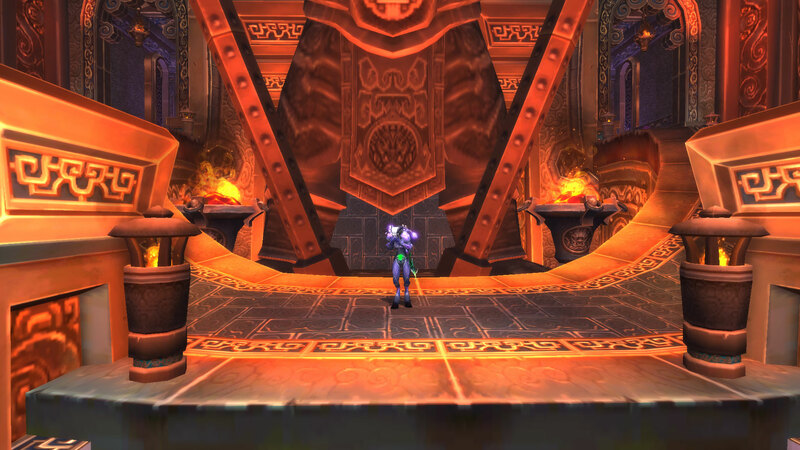 Community Blog Topic: What are you doing between now and WoD? Over at WoW Insider, they have a column called Community Blog Topic, which is a chance for the opinions of other blogs to be gathered and published on their site. This week, the question they asked was “What are you doing between now and Warlords of Draenor”? Fussypants and Yotaan blogged their answers here! Fussypants: Waiting for the expansion! Actually, I have quite a few goals I’m aiming to achieve before the next expansion comes out. 1) Get the legendary cloak on my mage. Yes, I’m kinda lame, but I only started working on the cloak very recently, so I’m not too far along. 2) Get the legendary cloak for my paladin. Again, just starting. This one may not happen. 3) PvP on my priest. I’m planning on trying my hand at PvP on my priest… when I get the time. 4) Max out all my professions across all my characters. Again, may not happen. 5) Help my friend out in WoW. A good friend of my recently started playing the game for the first time, so I want to help guide her through the world!